Set in the historic district of the Suquet, just a 5-minute walk from the Old Port, this hotel offers a flower-filled terrace and classic rooms with free Wi-Fi, just 400 metres from the famous Croisette. Guests are invited to relax in the garden and enjoy the Plage du Sud beach, just a 10-minute walk from the Chanteclair. A continental breakfast is provided daily and either served in the breakfast room or on the outdoor terrace. This non-smoking hotel offers express check-in and check-out, and free Wi-Fi is also available in public areas. 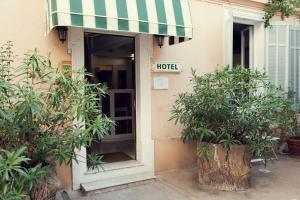 The hotel is a 1-minute walk from Marché Forville and a 10-minute walk from Palais des Festivals. Rue d'Antibes shopping street is a 5-minute walk away. Public parking is possible 50 metres away, and the first hour is free of charge.